Fitness & Bodybuilding - will allow you to achieve great results, within a short period of time. You can create your own program that will fit your needs. In addition, Fitness & Bodybuilding is an extensive database of exercises for every muscle, with a detailed description and video for each exercise. 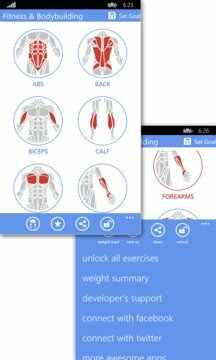 Furthermore, our App provides workout plans for bodybuilding, power lifting and fitness. And you can Track you weight regularly and can record it in a sophisticated manner. Why pay for expensive instructors when you can do it yourself? -Ability to choose measurement units (kilograms or pounds).